Starting as always with solid brass, we end up with a gorgeous addition to any home or business. Great for the powder room or hall. The arms are not parallel to the wall but come out from the center at an angle. 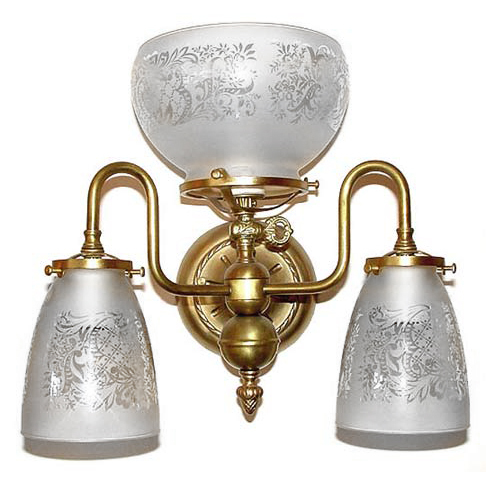 This is a gas light reproduction shown with French acid etched glass. The straight part of the arms coming out of the center body can be elongated, offering a wider overall width if needed. Many other custom options are available. Width 13 In. / Projection 11 In. / Depth 13 In.